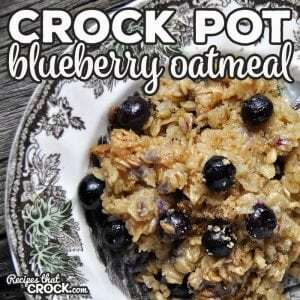 Crock Pot Blueberry Oatmeal - Recipes That Crock! This Crock Pot Blueberry Oatmeal is so delicious and super easy to make. It is sure to make your go-to-breakfast list for when company comes to visit or just to treat your family! Breakfast is my absolute favorite meal. We have Brinner (breakfast for dinner) around my house often just so I can have it more than once a day! Anyone else love breakfast? 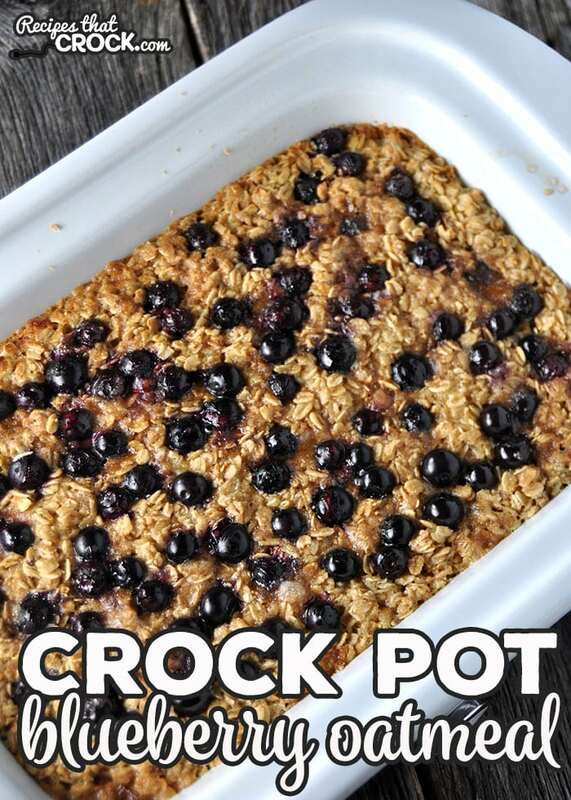 Well, this super easy and delicious Crock Pot Blueberry Oatmeal that I adapted from Gooseberry Patch’s Good-for-You Everyday Meals is sure to please even the non-breakfast lovers in your world! This is seriously easy folks. Mix together all of your ingredients except for your blueberries and brown sugar in a large bowl. Take a big spoon and put your mixture evenly in a greased casserole crock or 6-quart crock pot. Sprinkle your blueberries on top and press into your mixture. Finish up with sprinkling your brown sugar on top. Cover and cook on low for 2 hours. If desired (and if you are using an oven-safe crock), place in your oven on broil (high if you have a hi/lo option) for about 90 seconds to make the top nice and golden. The original recipe says that the brown sugar is optional. In this house, it is a must. I love it with this recipe, but feel free to omit it if you want. This is a “baked” type oatmeal. It is great for making ahead and then heating up individual servings for an easy breakfast. Mix together all of your ingredients except for your blueberries and brown sugar in a large bowl. Take a big spoon and put your mixture evenly in a greased casserole crock or 6-quart crock pot. Sprinkle your blueberries on top and press into your mixture. Finish up with sprinkling your brown sugar on top. If desired (and if you are using an oven-safe crock), place in your oven on broil (high if you have a hi/lo option) for about 90 seconds to make the top nice and golden.